Broken red veins are a common concern for many and can make the skin appear aged or damaged. Although harmless these red veins distract from a clear and even complexion and are can be more visible than other signs of aging. Telangiectasia (spider veins) and cherry angiomas (red dots) can be accentuated by age, hormonal factors, sun damage, rosacea and alcohol, along with the thinning skin associated with aging. Thread veins are common around the nose and cheek, where they can cause redness to the surrounding areas giving the appearance of flushed cheeks. Red spider veins are also common on the legs and other areas of the body. We use state of the art laser to remove unwanted and unsightly thread veins in a fast and very effective treatment. Laser vein removal works by targeting the veins at the surface of the skin with short pulses of laser light which causes the blood vessel walls to collapse, in a process called photothermolysis. The body’s natural waste removal systems will then clear away the broken down vascular tissue leaving a clear and blemish free complexion. 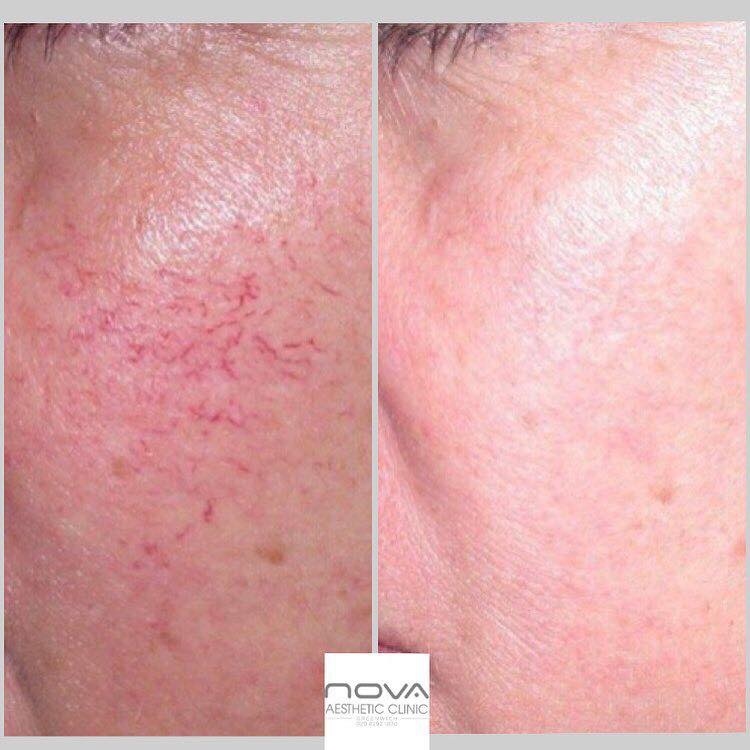 The laser is safe and FDA approved for use on thread red veins, the laser uses a specific wavelength to target the small vessels without causing damage to the skin or surrounding tissue. Our experienced laser practitioners work to medically regulated treatment protocols to ensure a safe and effective treatment. Who is suitable for Laser Vein Removal? Due to the energy and wavelength required we are only able to treat skin types 1-3 for thread veins. Most red veins are suitable for laser treatment however blue and varicose veins cannot be managed with laser. Patients with photo sensitizing medication or conditions would not be suitable for treatment. At consultation our expert laser practitioners will carefully asses suitability for treatment. Many people see immediate results from treatment with the vein discoloring and disappearing. We recommend 3 treatments to ensure that treated veins do not re-occur. Results are permanent, however people with thread veins are often predisposed to the condition and may require further treatment in different areas in the future.